Asbury Park, New Jersey. The Circuit, The Howard Johnson's, The Mermaid Mural - Sauro Motel	• Sauro Motel - The Collected Writings of Bobby Sauro. My brother and I visited Asbury Park, New Jersey recently to see for ourselves the new development that everyone from Travel & Leisure to The New York Times have been featuring. We didn’t stop by a real estate sales center, however. We did what Bruce Springsteen and older Asbury residents have done for years on hot, summer nights: we drove “The Circuit” down Ocean Avenue and up Kingsley. 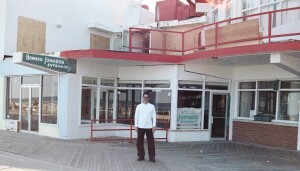 I was pleased to see some new additions to the boardwalk but not too much that Asbury no longer seemed to be Asbury. The old Howard Johnson’s was lit with the bright lights of a new ale house, but the circular structure (with the pointed roof) of the HoJo’s from the 1960s remained. The first photo below is the 2017 version. The second is your humble correspondent on an earlier pilgrimage during the pre-development era when orange and teal was still in demand. 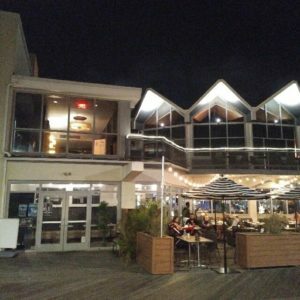 We surveyed the town from the rooftop bar of the new Asbury Hotel. The Asbury also saved the old Baronet theatre marquee and placed it on the side of their building in an outdoor, “car-less drive-in” area on the 5th Floor where they show movies and have yoga classes. That’s a great save. We battled four girls from Japan over who could take the more Instagramable photos under the sign (Spoiler alert: the girls, who were Instagram Pros, won). 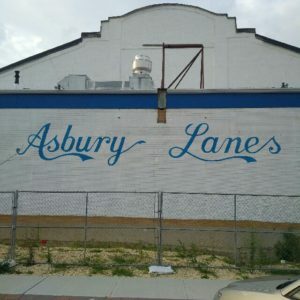 Word is that The Asbury Hotel also owns the land on which the abandoned Asbury Lanes sits. Another great save. Murals have appeared around the town, many around The Casino. North Beach, the area north of Convention Hall, always seemed to me to be a point where the boardwalk explorer turned around to see The Ramones at the Convention Center, to grab some fudge at Criterion Candies, or to finally face her future with fortune teller Madam Marie. 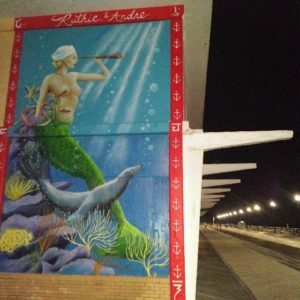 This time, there was more activity on the backside of Convention Hall, and a mermaid with a spyglass, seemingly showing me the way to something new. Something I won’t understand until my next visit.